Our reader, expatriate USCF Chess Master Hassan Sadeghi sent us his recent game against Noël Studer in a tournament in Switzerland. 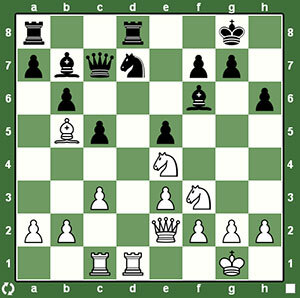 In this position, Sadeghi played a crushing move which forced his opponent to resign just a few moves later. Can you find it? The solution and the rest of game can be played out in the applet below, exported in one click from the chess software Chess King.